In “The Role of the Speaker”, The Speaker of the House of Representatives Lockwood Smith talked about the history of parliament as an institution and the core function, or main authority, of the House of Representatives: to hold the Crown to account for its expenditures. He based his core normative principle on his interpretation of the role of the Speaker and the Speaker’s authority in upholding the right of the House to hold the Crown to account. 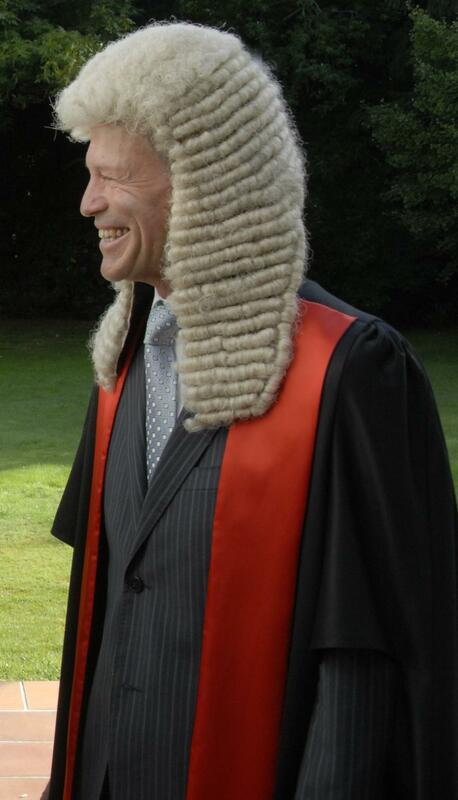 Speaker Dr. Lockwood Smith in full regalia — including the wig! In the 1600’s Charles I tried to bypass Parliament and levy forced loans without parliamentary approval. So desperate for money did he become that in 1640 he summoned the Long Parliament. Frustrated at not getting his way, he forced his way into the Commons in 1642 to arrest five senior Members. History has it that Speaker William Lenthal sent Charles I packing with the words: “May it please your Majesty, I have neither eyes to see nor tongue to speak in this place, but as this House is pleased to direct me, whose servant I am here”. The English Civil War followed five months later and Charles I was eventually to lose his head. Since that time, no monarch has entered the U.K. Commons or our Debating Chamber here in New Zealand. In that courageous action, Speaker William Lenthal established the Speaker as Parliament’s man and set the standard for future speakers in protecting the rights and privileges of Parliament. Of course the monarchy was restored in 1660 with Charles II followed by James II, but religious tensions saw Parliament at odds with the Crown until the glorious revolution in 1688 and the passage of the Bill of Rights Act. It was the start of the constitutional monarchy and, in 1690, the Commons took control over the Crown’s use of revenue as well as taxation. Those crucial separations of power so fiercely fought for over hundreds of years, remain today and establish, to my mind, the breadth and depth of the Speaker’s role. The role is not just chairing or presiding over the House. It is, in its full context, about ensuring the House of Representatives is free and able to function effectively both as a legislature and in the vital role of holding the Crown or Executive to account. It is where Ministers are tested with a clear, concise question seeking information that I apply the full force of the Standing Order that an answer must be given if can be given consistently with the public interest. A wise friend recently suggested that we should think of constitutional conventions in the Westminster system as such: the decision-maker should based his decisions upon the normative purpose of the convention, taking into account exceptions and exemptions in order to make the right decision case by case. Speaker Smith seems to adhere to this approach: “It would be fair to say that, as a former scientist and not a lawyer, I am more guided by primary analysis than precedent.” Based on Smith’s explanation below, I interpret “primary analysis” as the examination of each situation case by case and making the decision based on a core set of norms rather than a slavish devotion to bad precedents that ought not to be followed. Having analysed the Standing Order somewhat differently from my recent predecessors, I have then applied my second test – what interpretation of the Standing Order best serves the rights of the House of Representatives in holding the Crown to account? – the Speaker William Lenthal test, if you like. Speaker Lockwood Smith is a true parliamentarist because he appreciates the centuries of history that his office embodies and that he must exercise his authority as Speaker of the New Zealand House of Representatives in order to allow the House to undertake its core function of holding the Crown to account. The Speaker thus supports responsible government. Speakers Bercow and Sheer should take note of their erudite Kiwi counterpart! This entry was posted in Parliament, Parliamentary Privilege, Reaffirmation of, Traditions and History and tagged Charles I, Charles II, James II, John Bercow, Lockwood Smith, Peter Milliken, Sir William Lenthal. Bookmark the permalink. Before you canonise him, Lockwood Smith didn’t stop the National Government’s abuse of ‘urgency.’ This was used to pass contentious legislation and bypass select committees when attention was on other events such as the Rugby World Cup and Christchurch’s earthquakes. A lame-duck Opposition didn’t improve the situation. Judging from the description on the website of the Parliament of New Zealand, it sounds like a legitimate parliamentary tactic that the government can use to outwit the opposition. The NZ Standing Orders regarding Oral Questions read quite differently from those in other jurisdictions, such as Canada, and would allow for such an interpretation – they clearly state that an answer “must be given if it can be given consistently with the public interest.” The CDN HofC Standing Orders are completely silent on the matter of answers to questions. There’s barely anything in the SOs about Question Period other than it’s a daily procedure and if a Member doesn’t like an answer, they can call for a late show. The Ontario Standing Orders clearly state that ministers don’t have to answer. I don’t see how Scheer or an Ontario Speaker could try to make ministers answer or provide better answers given that there’d be no SO to “interpret” in a different way. All they have is precedent, and the precedent is that ministers don’t have to answer, or can refer a question to another minister. All of this is part of my reform package, which I’m deriving from the best practices of our sister Westminster parliaments. We should change our Standing Orders, and more fundamentally, adopt the British system of Question Time in full, as I advocated in an earlier post.